The design maneuvering speed. It is the highest equivalent air speed at which the limit load factor can be applied (the aircraft will stall, thus preventing overloading) or at which full deflection of the controls can be safely made. The aquaplaning speed. It is the speed at which the aircraft wheels lose effective contact with a runway covered with water. 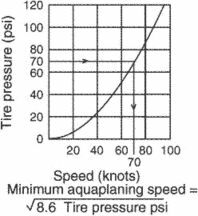 It is a function of the tire pressure of the aircraft, and its value in knots is approximately 8.6 times the square root of the tire pressure in pounds per square inch. Also called a hydroplaning speed. See also aquaplaning. The country code for the Vatican.